At least two dame schools or 'academies' are known to have existed in Calverton in the eighteenth and nineteenth centuries. One was run from a cottage on Main Street (142) by the wife of Matthew Shepherd, the headmaster of the Labray Endowed School. No detailed records survive of these schools but information from other areas suggests that most dame schools catered for very young children and were very often little more than baby-minding centres. 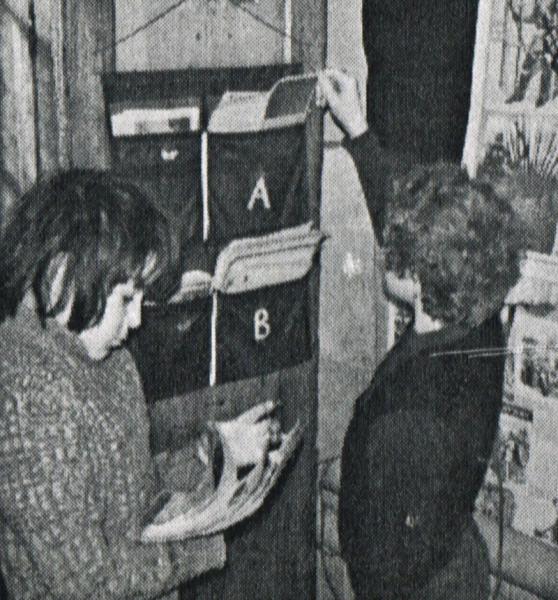 They were usually run by elderly women, many with little or no formal education themselves, who took children from the neighbourhood for a weekly fee. A National Commission carried out by the Duke of Newcastle in 1859 found that most concerned themselves exclusively with reading and sewing, and writing was hardly attempted. Many dames ran their schools alongside other occupations such as taking in washing. The routine was monotonous in the extreme. Records of a dame school in Worcestershire show that the children spent their mornings learning letters and their afternoons sewing. Their morning break was a run around a tiny yard and toilet facilities comprised a small chair with a hole in it over a broken saucepan. Standards no doubt varied tremendously according to the character and education of the woman in charge. Given Mrs Shepherd's position as the wife of a schoolmaster and the high status of the Shepherd family in the village, it is likely that her 'academy' offered a higher standard of care and education than most. Many charity schools were established in the eighteenth century by the Anglical Church through the Society for the Promotion of Christian Knowledge; by religious dissenters, especially the Independents and Methodists: and by independent benefactors. 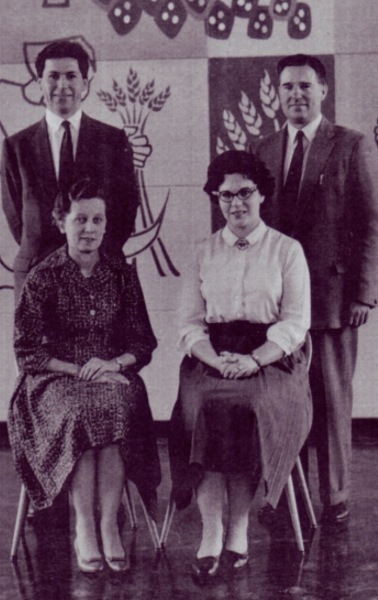 The Jonathan Labray Endowed School was part of this new movement. Jonathan Labray was a stocking-frame operative in Nottingham in the early eighteenth century when the stocking trade was booming. A thrifty man who never forgot his humble origins, he made provision in his will for his money to be used to benefit the poor. He had a special connection with Calverton, having owned land and property around the village, and the trustee of his will decided to set aside ten pounds per annum from his estate to be devoted to charitable purposes in Calverton. This sum was used to support a schoolmaster who would teach poor boys from the village free of charge. The endowment was made in 1718 and the Labray School continued to educate village children for 255 years until its closure in 1973. 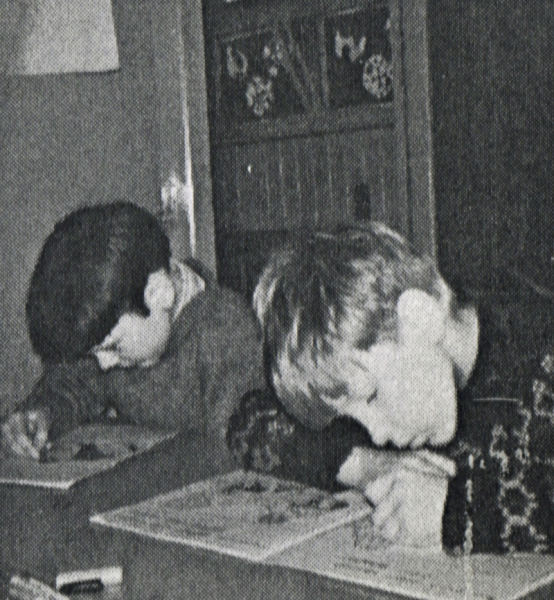 In the early years the boys attended school at the schoolmaster's house which contained a classroom. A seperate building was constructed in 1855. Last days at Labray. 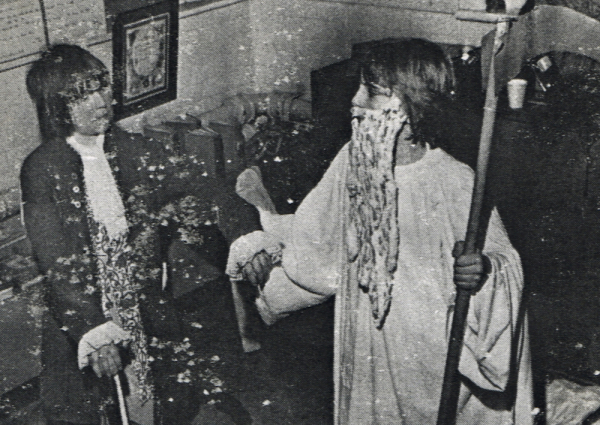 Father Time (Josh Regan) and Jonathan Labray (Paul Pearson). Last days at Labray. Cavalcade - News Vendors, Ian Worrall and Adrian Davies. 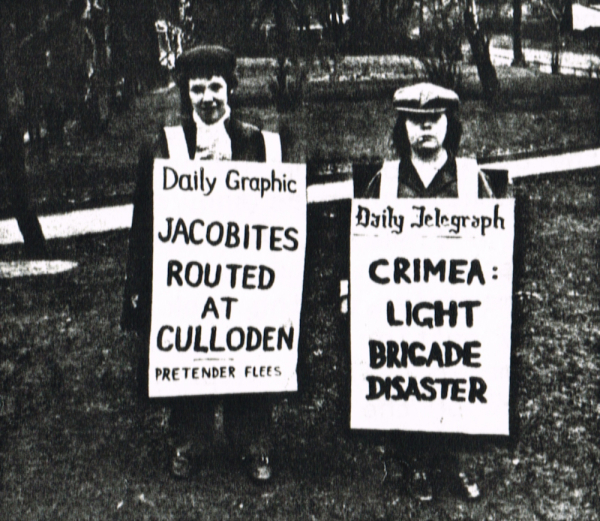 No provision was made for the formal education of girls in Calverton until the middle of the nineteenth century. In 1846 a church Sunday School was built on Burnor Pool and enlarged in 1852 'for the education of poor children in the Parish of Calverton according to the principles of the National Society. ' 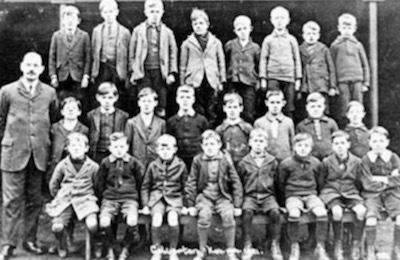 The National Society was an educational society affiliated to the Church of England which had worked to promote the education of the poor since 1811 and had established large numbers of schools across the country, usually paid for by local donations. 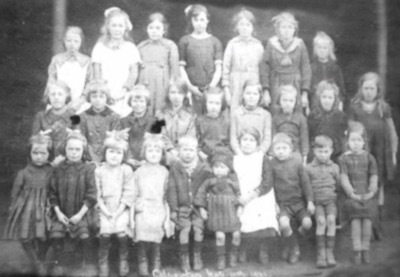 The National School in Calverton catered for girls and for young boys not yet old enough to attend the Labray School. It was a two-storey building, the older girls being taught upstairs and the younger children on the ground floor. Like other National schools it probably used older children as 'monitors' to instruct younger pupils and to carry out a number of routine tasks such as calling the register or repairing quill pens. Slates and reading cards were the basic equipment for the pupils although the smallest children wrote in sand trays. Much of the day would be occupied with rote learning, the children spending many hours on their feet following the instructions of the monitor. The three R's the catechism and the Bible were the staple diet of National School children. In 1888 an appeal was launched 'for funds to celebrate the ter-centenary in 1889 of the invention of the stocking frame by William Lee by construction of an institution building adjacent to the school and by chancel restoration'. The appeal was supported by the Bishop of Southwell and by the Mayor of Nottingham. Land was acquired 'freely and voluntarily and without consideration' from Charles Seely, then M.P. for Arnold, and a new school with a reading room and library attached was built. The latter - the Lee Memorial Room - is now used by the Parish Council. The National School moved into its new building, the present St Wilfrids School, in 1892. However, the original building still stands. 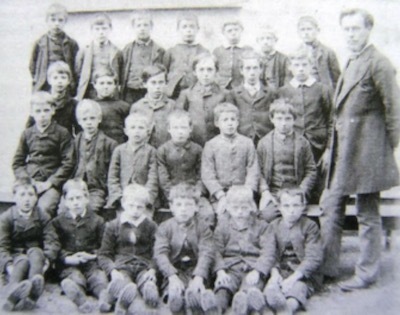 By the early part of this century public elementary education in Calverton provided for 100 boys at Labray and 200 mixed and infants at the National School. This pattern of education seems to have continued until the war years, the older girls being transferred to Arnold at the secondary stage. However, with the opening of the colliery and the building of the two new housing estates the schools became drastically overcrowded and parents rebelled. A protest meeting was held and the local authority acted. 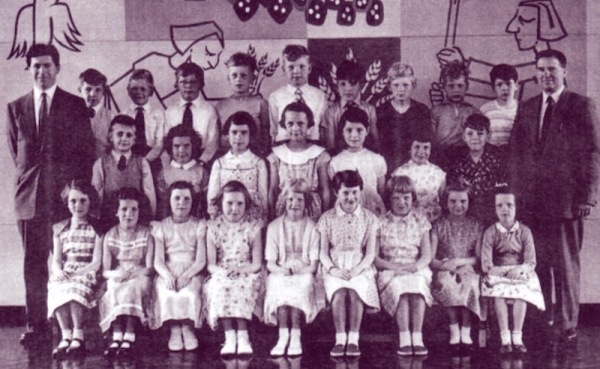 A plot of land lying between the two housing estates was acquired and the school campus began in 1955 with the opening of Manor Park School as a four-class mixed primary and the following year of the William Lee** as a seven-class junior mixed school. Next came Calverton's mixed secondary school, the Colonel Frank Seely School with 220 pupils. In 1960 the Sir John Sherbrooke opened with 8 rooms for juniors, and Manor Park became a school for infants only. The old St Wilfrids building was proving inadequate. More land was acquired to build a new block of classrooms with a kitchen and dining room. 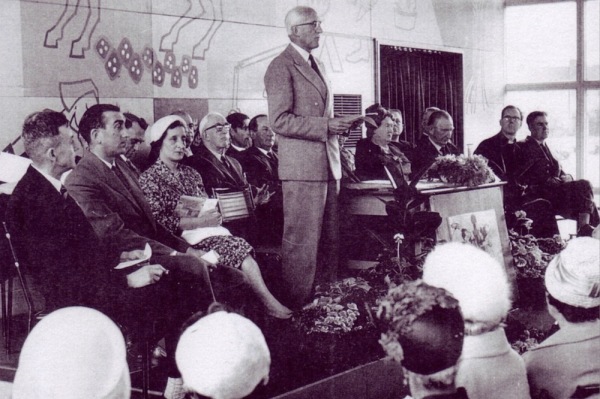 The opening of Sir John Sherbrooke 1960. Lord Sherbrooke opens the school. 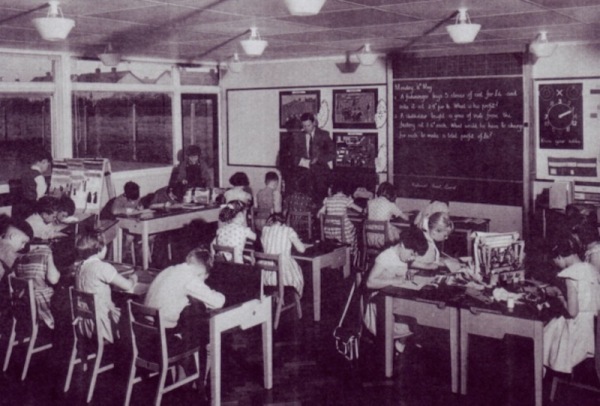 In the early 1960's additional rooms were built at the Colonel Frank Seely School and it could then accommodate 474 pupils. By the year 2002 there was 1163 pupils on roll, a number coming by coach from the surrounding towns and a number of villages. There is also a Leisure Centre with a swimming pool and facilities for activities such as Badminton, Squash and a 5-a-side football. On the Seely School campus there is now a synthetic All-Weather Football pitch too! **Because of falling numbers, this school has lost its separate identity and is now the William Lee Building, used by the Colonel Frank Seely School's Sixth -formers.